This is yet another brilliant offering from Nagesh Kukunoor. Like a good chef, he takes a simple recipe and executes it perfectly with good ingredients to produce a great result. The actors and technical departments are top-quality, the story is original and refreshingly simple, and the direction is perfect. 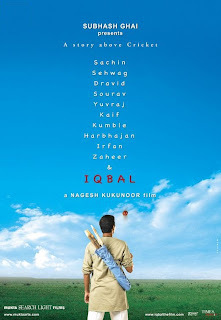 Iqbal is the story of a deaf-mute village boy, born at the moment of India’s 1983 Cricket World Cup triumph (or perhaps when Kapil Dev won the semi-final match against Zimbabwe almost single-handedly). Iqbal has an innate but unschooled talent for cricket. The story is about his struggles to learn the game overcoming his own physical limitations, his father’s restrictions, and the political intricacies of cricket academies; and whether he can triumph over the many obstacles that come in his way. The film excels in its immersive realization of the its environment. The setting of the film is that of a village somewhere in India, where Iqbal spends his days tending his father’s buffaloes. The story-telling in this movie and its pacing are in harmony with the simplicity of the environment. It is a very textural movie. You can almost feel the grass under your feet when Iqbal gets ready to bowl. The dull thud you hear when Iqbal drives his makeshift tree-branch stumps into the ground almost convinces you you can smell the sap. You can almost smell the haystack on which Iqbal’s mentor Mohit (played by Naseeruddin Shah) wakes up after a night of drunkenness. When Iqbal first walked into Mohit’s shadowy ancestral British-era haveli, I could almost feel the dank coolness inside. I’ve never seen a small-town cricket training academy or stadium, but after watching this movie, I imagine I have a feel for what they must be like. This is one of those rare films where many different actors get a lot of screen time. Shreyas Talpade as the title character Iqbal dominates the screen for most of the time, of course, but the other actors’ characters are all very well-developed as well. Shweta Prasad excels in the role of Khadija (Iqbal’s sister). Naseeruddin is superb as Mohit; you can almost feel his drunken character’s hangover each morning. Girish Karnad gives a balanced performance as the political Guruji, capturing the character’s ambiguous morality. Prateeksha Lonkar and Yateen Karyekar are perfect as Iqbal’s parents. But the star is, of course, Shreyas Talpade. Talpade seems to work with Kukunoor a lot, and it seems like one of those win-win professional relationships. This movie really showcases how fine an actor Talpade really is. It’s hard to describe it all, but there’s no single place in this movie where what he does looks the least bit unusual. His look of mild incomprehension at conversations he can’t hear, his moments of elation, perplexity, gloom and his usual neutral good cheer, Talpade does them all, neither underdoing nor overdoing them. And now for my pet peeve with Indian sports movies: again, this movie fails to showcase the sport it is based on. This movie may have captured the spirit of the cricket institutions themselves. But I would have loved to see some insane inswingers or yorkers. I wanted to see Iqbal scalp Kamal’s (Adarsh Balakrishna) wicket with a ball so good that I’d burst out in spontaneous applause. These could have been bowled by a mainstream bowler and sliced in with Talpade’s action. To Talpade’s credit, he has a pretty reasonable bowling action. But the ball trajectories are played down a bit and they are nothing to write home about. In this context, I am reminded of the excellent football movie Goal starring Pele and Sly Stallone. I’d like to see a movie with that kind of reverence for the technical game itself. This is not the kind of film that induces extreme emotional responses. It is low-key, not designed for one-a-minute thrills, maudlin emotional blows or cringe-inducing evil. Even the worst character in the movie (Guruji) is simply political, not evil or malevolent or even particularly antagonistic towards Iqbal. This movie treats its subject matter with respect. But that doesn’t mean it’s dry or fails to connect with the viewer. It’s highly enjoyable, realistic cinema. There has been a lot of apprehension about the Twenty20 format. It is such a short version of the game that people are worried it will result in a sort of hack-and-slash cricket. It is so attractive and popular that there are worries the beauty and the fine technique of longer versions will become obsolete. But maybe not. The Kitply cup ODI victory may be an indication of how the Twenty20 format can actually help players prepare for ODI matches. The Indian team in the first match between India and Pakistan was fresh from the first IPL Twenty20 tournament, and not only ended the 12-ODI winning streak of the ODI-trained Pakistan squad, but routed them by 141 runs. India gave away 3 extras; Pakistan gave away 38. Pakistan fielded miserably, dropping crucial catches which allowed the Indian top-order batsmen to raise the Indian total to 330. Of course one match is not enough evidence, but maybe the Twenty20 format forces players to play a tighter, more focused game, something that the ODI-trained Pakistan squad simply had no answer to. It’s a different, more nimble kind of warfare. One of the biggest complaints about the Twenty20 format is that it is designed so that batsmen can go after bowlers. 20-run overs are not uncommon, and some think this will discourage bowlers. This is a misconception based on an inability to adjust your measures to a different situation. It needs to be understood that in Twenty20 a 10-run over is not so bad. A 5-run ODI over is the same quality as an 8 to 10-run Twenty20 over; that’s all. If anything, the bowlers’ performance becomes even more crucial in Twenty20. The value of a bowler who can pull off some tight overs is very high in the 3-hour format, and the bowlers end up bowling more accurately under more pressure. This hones their skills. The overall effect of Twenty20 remains to be seen. But initial indications are that it looks like a great thing for Indian cricket. It is well known that Australian cricket uses all the resources at its disposal to advance whatever causes it has. In addition to using the best training available, Australians also use sledging to win matches. Australians also tend to be “forgiven” more easily for on-field confrontations than cricketers from the subcontinent, and are good at being the first to level pre-emptive, or first-strike, accusations of a variety of sorts at everybody. Such allegations include accusations of cheating. Almost all their accusations have proved unfounded. In the last one year, Australian cricket has started its most ridiculous accusation fad yet. Increasingly, allegations of Indian racism have begun emerging out of Australia. Darrell Hair was the first to do this. In the fifth India-Australia one-day international in India this year, the Australians began accusations of “racial abuse” by Indian spectators. Both allegations are ridiculous, and the Australian cricket board knows it. That is why both allegations were never acted upon by them… they know such allegations wouldn’t survive any sort of scrutiny. However, the accusations do serve to muddy the waters and set precedents for accusations of Indian racism. After several years of such accusations, they will become sufficiently well-entrenched to be taken seriously. The only remedy for such accusations is for cricket bodies to investigate them and expose them for the frivolous sensationalism they are. This would diminish the credibility of the Australian cricket board, forcing them to think twice before throwing such accusations around. Till recently, the BCCI was an absolute baboo-run dinosaur. BCCI officials, who are richer than most of the players, cared for their jobs even less than the Indian bureaucracy does. BCCI was, and still is, a den of politics, with cricket taking a back seat to the bureaucrats’ and politicians’ personal agendas. This still continues (as evidenced by the shameful eclipsing of the cricketers at the T20 felicitation at Wankhede by politicians), but the BCCI has got a major jolt in the form of the ICL. Suddenly, players are being rewarded for their performance (although, as Steve Waugh pointed out, in a way that’s harmful for the team spirit). Suddenly, the players’ pay has increased, and BCCI is actually trying to improve conditions and opportunities for its players. Bureaucrats and politicians who have been snoring for decades are having to wake up and actually do a good job. Let’s hope the ICL does a great job of developing talent. It’s good to give the BCCI a run for its money. Even if ICL doesn’t win the war, the competition is bound to force the BCCI to increase its effectiveness. Cricket statistics indicating performance for batsmen commonly include the number of innings played, batting average, number of ducks, and scoring rate. One crucially important statistic that is missing from this list is any measure of consistency. Inconsistent batsmen who tend to score big occasionally can have inflated averages that belie their true worth to the team. Consistency is much more valuable than the number of centuries scored. Thus it is important to include a measure of consistency. What measures might be good? Variance, absolute deviation and entropy are all decent absolute measures of consistency. At least one of these should be reported along with the other statistics for every batsman. I update these from time to time. What’s Wrong with a Hunger Strike?